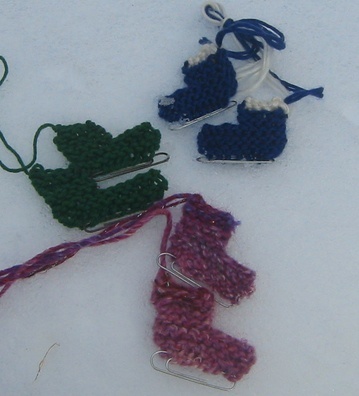 Ever since I can remember, our Christmas/Yule tree was adorned with little ice skates that someone crochet for us. My sister and I use to love to take them off the tree to play with them and make them skate. Since I don’t crochet, I made my own pattern for knitters. It’s really simple! Bind off the first 5 stitches and knit the next five. 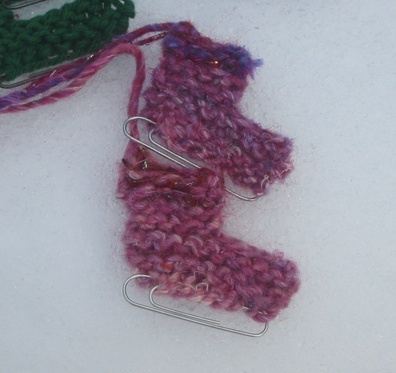 If you are using a contrasting yarn for the top of the ice skate, switch to contrasting yarn. Bind off and cut yarn, leaving a 10 inch tail. Tie off the yarn. Once you have your two skates, tie the top 10 inch tails together and weave in the other loose ends. Weave the jumbo paper clip into the bottom of the skate. 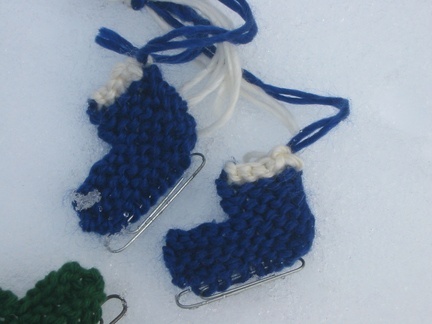 Hang them on a tree, tie them to a present, put them over a piece of cardboard with a magnet underneath and make them skate, heck, tie them to your cat’s feet and pretend she’s a gold medal figure skater (ok, not really, I don’t want to get sued for animal cruelty! )… just enjoy them! Thanks so much. My Grandma used to crochet these too. I don’t crochet but I knit and will make some of these this week.